Russias Minister of Defence Sergei Ivanov ordered on Sunday a temporary halt to the towing of decommissioned nuclear submarines following the sinking of the derelict K-159 still loaded with nuclear fuel as it was being towed through a fierce storm early Saturday morning, killing nine of the 10 crew members aboard. 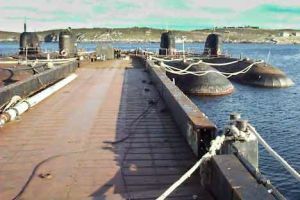 The rusted-out and dilapidated submarine was being towed by a tugboat on a 350-kilometre journey from the Gremikha naval base to the Polyarny shipyard, where it would have been dismantled. Instead, two days into the journey, it ran into weather violent enough to tear it from the four pontoons that were keeping it afloat. The tugboat crew managed to save one of the crew members, Maxim Tsibulsky, and recovered the bodies of Mikhail Gurov and Yevgeny Smirnov, as the submarine sank in the frigid and murky waters of the Barents Sea. Chances that any other members of the crew survived, according to Naval Chief of Staff Admiral Viktor Kravchenko, are nil. It appears that no hope remains that any of the members of the crew are still alive, he said late Saturday. Defence Minister Ivanovs announcement on Sunday banning the towing of decommissioned submarines followed a meeting with the relatives of the victims of the K-159 disaster, in which he promised to raise the submarine from the sea floor, the Associated Press reported. He also said that the foundered submarine will be raised from the bottom of the Barents Sea, where it sank some 5 kilometres northwest of Kildin Island. He also said the K-159 lay under 240 metres of water, as opposed to 185 metres, which the Defence Ministry reported yesterday. The depth referred to Sunday by Ivanov, apparently, came from new data obtained overnight by remote control cameras, the RIA Novosti Russian newswire reported. The cameras also revealed that the hatch on the conning tower of the sunken vessel was open. If this new depth assessment is accurate, it poses even bigger dangers to the vessels two reactor compartments—which Russian Navy and Defence Ministry officials have insisted are safe and pose no ecological risk—as they will be under even more strain from the additional water pressure, chairman of Bellonas St. Petersburg, Russia, office Alexander Nikitin said in a telephone interview. According to Nikitin, the some 25 atmospheres bearing down on the already rusting and hulking vessel made the situation even more dangerous, for the hazard that some reactor leak could occur, contaminating the fish-rich area of the Barents Sea. The discrepancy between Saturdays figures on the depth of the sunken submarine and the figures reported today by Ivanov came as a surprise, given the intensified risks that Ivanovs figures suggest. But neither the Russian Naval Headquarters nor the Defence Ministry could be reached for comment to clarify if Sundays data were considered final. Further dangers to the reactor compartments are posed by the submarines age. The K-159 was decommissioned in 1989, but it had been last refuelled in 1972, making the spent uranium fuel that is still in its reactors far more radioactive than if the vessel had gone down with a fresher fuel load. Added to that is the corrosion of the boats hull as it sat awaiting decommissioning. There is a further possibility that Gulf Stream currents, which run east through the Barents Sea, will carry that radioactivity further afield. The submarine has two VMA-type reactors, each with a thermal capacity of 70 megawatts. The reactor cores of these reactors contain approximately 800 kilograms of spent nuclear fuel with the radioactivity of 750 curies per kilogram. Bellona is carrying out its own detailed investigation into the possible radiation risk to the area. Because of the reactors precarious condition—which may be considerably worse after the impact with the sea floor—and revelations that the vessel is apparently deeper than initially thought—it is Bellonas position that the Russian Navy should investigate all posibilities of lifting the vessels without causing further damage to reactor cores. Ivanovs moratorium on towing raised the prospect of further delays to dispose of Russias nearly 130 mothballed nuclear submarines that rot floating in Russian ports, posing extreme environmental hazards. Nonetheless, it is the position of Bellona, other environmental organisations and some retired naval officials that towing is far too dangerous, and that there are better methods for transporting these ailing vessels. Some of the safer, but more expensive, methods include sending a special defuelling ship to the submarine. In Northwest Russia, there is one such ship, called the Imandra, which is operated by the Murmansk Shipping Company. Imandra services Russias civilian nuclear icebreakers, but has been used in naval defuelling operations before. Another option, suggested by Bellona, is shipping submarines with the help of a floating dry dock, also a more expensive, but much safer, method. Likewise, land-based defuelling facilities are safer, but in short supply. Bellona clearly warned the Russian Navy in 2001 that towing submarines from Gremikha carried with it precisely the sort of risks that caused Saturdays catastrophe, and recommended to the Russian government that the submarines at this base be dismantled onsite. Within the past few years, there were 17 submarines laid-up at Gremikha and awaiting dismantlement. Now there are from six to seven submarines—with the exclusion of the K-159—waiting to be towed to Polyarny. They chose the cheapest, and worst option, said Nikitin, a former submarine captain first class and co-author of Bellonas report The Northern Fleet: Source of Radioactive Contamination. Bellona suggests that the Russian Navy, in this case, ignored safer option. By entrusting the dismantlement of the K-159 to the Polyarny shipyard, which is one of the few shipyards left under the control of the Russian Defence Ministry, the Navy was apparently aiming at redirecting funds to its own shipyards. Northwest Russias remaining shipyards—Nerpa, Sevmash and Zvyozdochka—fall under the purview of the Russian Shipbuilding Agency. Had the defuelling been handled by the Imandra, and subsequent dismantlement by a Northwestern Russian shipyard not connected with the Defence Ministry, the money would have bypassed the Navy. One of the many burning questions about the sinking that still remain unanswered is why a crew was aboard the K-159 at all. Decommissioned ship, while in port, maintains a skeleton crew, but the fact that this crew would remain on board while the vessel was being towed to a dismantlement point is a striking anomaly, said former naval officials and submariners. Every safety rule was violated, retired Admiral Eduard Baltin, who once commanded the K-159, told the Russian NTV television channel yesterday. By last evening Russias deputy prosecutor general, Alexander Savenkov, brought suit against the Northern Fleet and the chief of the Gremikha base, Captain Second Class Sergei Zhemchuzhnov for violating Russian sea navigation laws. Initially, the K-159 was scheduled for dismantlement last year, but Northern Fleet officials postponed the dismantlement, for reasons unknown, until July 2003. That, too, was put off until this Friday night, even though Northern Fleet brass had reportedly received weather forecasts that were less than favourable for the K-159s transfer to Polyarny. The Northern Fleet decided to send the vessel on anyway. So far, Vladimir Kuroyedov, the Russian Navys commander-in-chief—who presided over the 2001 Kursk disaster—has managed to evade any official accusations. Zhemchuzhnov, meanwhile, has been suspended from service. Ivanov and the Kremlin—acutely aware of the similarities between the most recent sinking and the Kursk disaster—reiterated promises to raise the K-159, even though preparations could take several months and several million dollars. The Kursk—the Oscar II class submarine that tragically sank during training exercises three years ago, also in August, killing all 118 aboard—was eventually raised by a Dutch consortium after a year of complex preparations and cost $65 million. But the Kursk lay at a depth of 108 metres. The K-159, regardless of which version of its depth is true— 185 or 240 metres— is still deeper than where the Kursk was and will for that reason, and the reason of its arctic location, be considerably more difficult to raise. Ivanov, according to RIA Novosti, said that the Defence Ministry had paid travel expenses to Severomorsk, the headquarters of the Northern Fleet—near the Gremikha naval base—for families of the dead crew members. Additionally, Murmansk Region Governor Yury Yevdokimov said his administration would pay 10,000 rubles, or about $330, in compensation to each of the victims families. Prior to meeting with the families, Ivanov and Yevdokimov visited the K-159s sole survivor Tsibulsky in the Northern Fleets hospital—where Ivanov presented him with a watch for his courage and heroism, and Yevdokimov gave him an envelope containing the promised 10,000 rubles in compensation, RIA Novosti, as the only journalists apparently allowed to see Tsibulsky Sunday, reported. Tsibulskys physical condition is considered to be stable, but it was apparent in conversation with Ivanov that he is still psychologically shaken by the incident. He told the defence minister he had been terrified during the approximately two hours he spent in the frigid waters. Despite a massive air and sea search of the area where the K-159 went down, none of the bodies of the seven remaining crew members have been recovered. Emergency drill at Russia’s Nerpa yard makes for a nice show, but is Russia prepared to handle a real radiation accident?